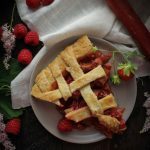 The world may not need another blog post about strawberry-rhubarb pie, but I need to write this one. Because it’s not just about pie, it’s about a pie for my dad. My dad has the misfortune of his birthday only being a week or so before Father’s Day, so we tend to lump the two together. Also he’s quite difficult to shop for, so we tend to… not shop for him. 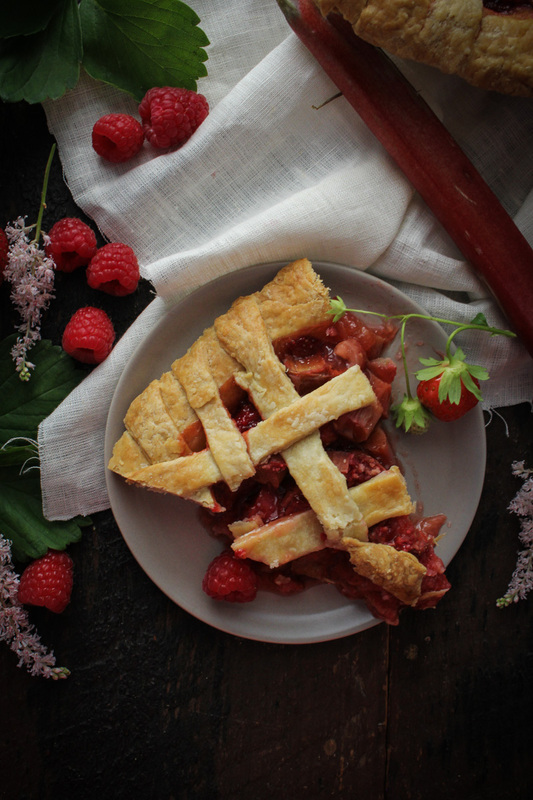 But this year I’m going to celebrate him properly – starting with this blog post, and a strawberry-rhubarb-raspberry pie. I become more and more grateful for my parents the older I get. Particularly this year as we prepare for our wedding, I don’t know where we would be without them. We’re getting married at their house in Maine, and my dad built us a barn, by hand, for the reception. It’s absolutely beautiful and so special to be celebrating at a place we both love. (Lest you think I’m even more spoiled than I am in reality, the barn, who’s primary purpose will be boat storage, was always in the long term house plan, just bumped up a few years). The long farm tables we’ll gather at will be my dad’s handiwork as well. Not to mention the hours of yard work and prep required to host a wedding! The wedding is a big thing, but I’m grateful for all the little (and other not so little) things too. The emergency plumbing assistance when our pipes burst while we were in Portugal. Bringing us a piano rescued from a friary. The tax help phone call I make every year on April 14th. Driving me and a pile of my adult friends to and from our high school reunion last weekend when we did a little too much day-drinking. Teaching me how to play soccer and to sail, even though I never really fell in love with those things. Teaching me to play piano, which I do love. My dad doesn’t like to sit still. He always has a dozen projects going on, and a “master plan” he’s ready to share with you. When we’re up in Maine, he can usually be found tractoring something or cutting down a tree – we (lovingly) call him The Onceler. He loves to be on the water, the reason we find ourselves with such a collection of boats. Some of my fondest memories of Maine are of early mornings out on the harbor, dad at Clifford’s helm, skimming the ocean’s surface while its still glassy, looking for dolphins. I could go on, but the point is, my dad is a good guy. Some might say a Great Man. And it’s time to tell you about this the pie. My dad has always loved strawberry-rhubarb pie, but after many attempts deemed “a little too soupy” my mother refuses to make any more. Don’t get me wrong, my mom is an amazing cook, and she’s particularly good at baking pies. 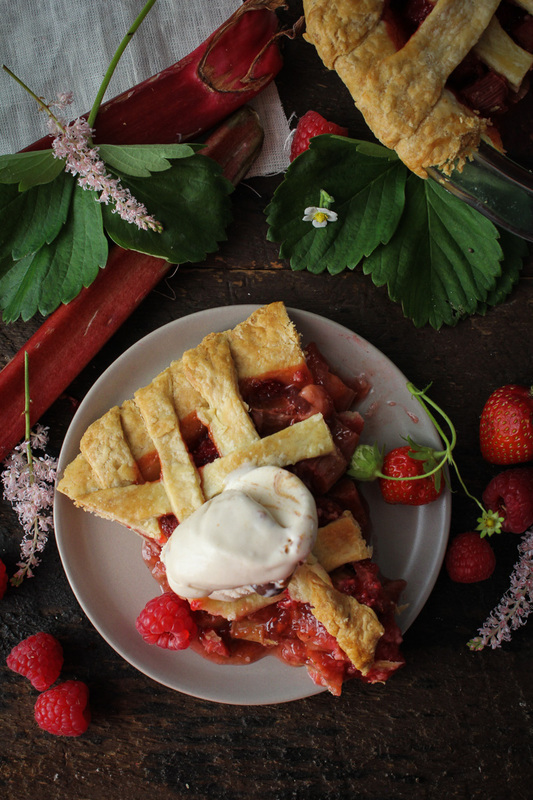 But strawberry-rhubarb pie is just not her thing. 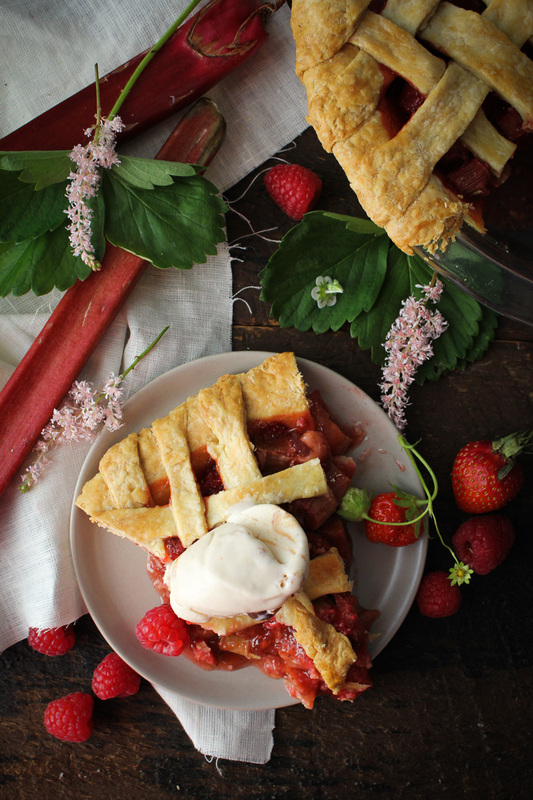 So I’ve taken the baton from her and am the strawberry-rhubarb pie baker this year. Actually, I made two pies – one to take to my dad last weekend, and one to share here. 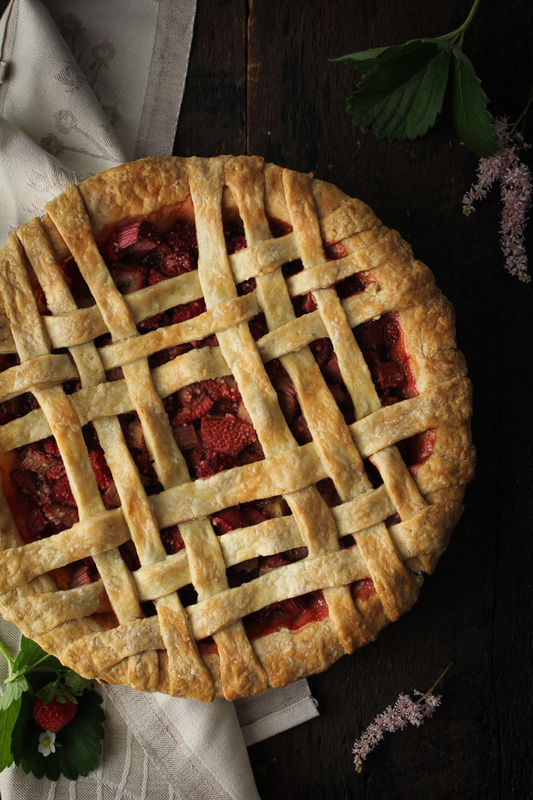 I added raspberries to both, making this a strawberry-rhubarb-raspberry pie, and did my best at a lattice crust. Trevor is a bit persnickety about these things but I think even he approves of this lattice. The filling is still a little bit loose – I’m not sure there’s a way around that – but holds together well enough to slice neatly. Just make sure you don’t cut into it right away, as it needs several hours post-baking to set up properly. Happy birthday and happy father’s day, dad! I love you and I hope my pie was up to snuff. 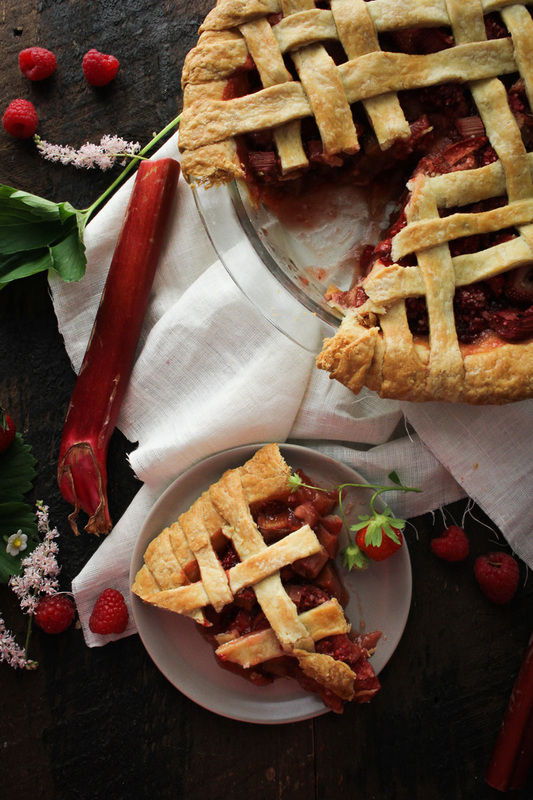 A not-too-soupy, not-too-firm Strawberry-Rhubarb-Raspberry Pie with a lattice crust and a hint of vanilla. Adapted from Smitten Kitchen and Sally’s Baking Addiction. Make the pie crust: In a large bowl, mix the flour and sea salt together. Cut the cold butter into the bowl in small pieces, aiming for about 1/2 TBS per piece. Use a pastry cutter or a fork to cut the butter into the flour until it is crumbly with pea-size pieces of butter. Whisk together the eggs and the ice cold water in a small bowl until evenly combined. Add about half of the egg mixture to the flour and use a fork to quickly mix, moistening as much of the flour as you can. Test to see if the dough will hold together when pressed. If not, continue stirring in a splash of the egg mixture at a time until the dough just barely holds together when gathered into a ball. Once the dough holds together, stop adding the liquid, form into a ball and wrap tightly in plastic wrap. Refrigerate the dough until thoroughly chilled, at least 30 minutes. Prepare the filling: Add the sliced rhubarb, sliced strawberries, raspberries, vanilla, cinnamon, brown sugar, white sugar, and tapioca granules to a large bowl. Stir gently with a wooden spoon until all of the filling ingredients are fully mixed and the fruit is coated with sugar. Set the filling aside. Make the pie: Preheat the oven to 400 degrees F. Prepare a flat work surface for rolling out the dough by putting a dusting of flour on the work surface and on a rolling pin. Divide the dough into two pieces – one that uses 2/3 of the dough and the other that uses 1/3 of the dough. Roll the larger pieces out into a large circle that is about 1/4 of an inch thick and 12 inches in diameter. Carefully transfer this piece of dough into a 9-inch pie plate. Very lightly press the dough into the pie plate so that it the dough is touching all of the sides of the pan. You should have at least a half inch of overhang on all sides. Spoon the filling into the prepared pie crust, taking care to fill the pie evenly and remove as many air gaps as possible by spreading the fruit around. Roll the second piece of pie dough out into a circle and cut into strips that are about 1/2 inch wide. 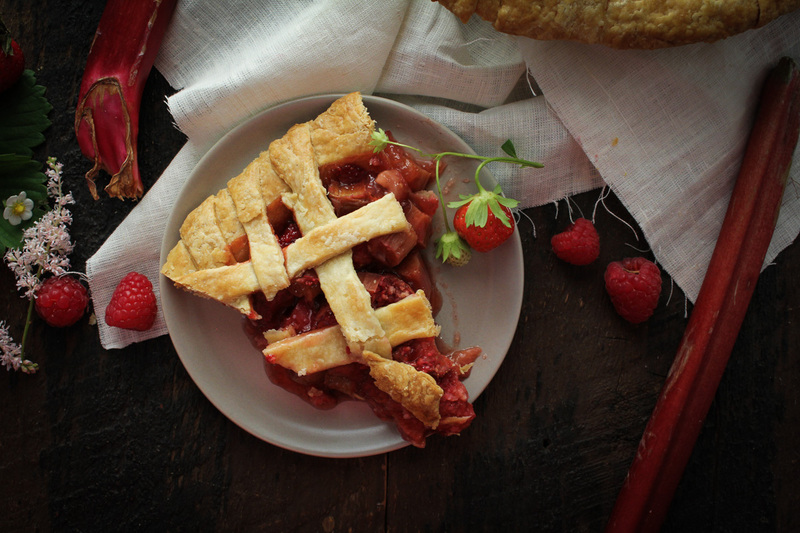 Arrange the strips in a lattice pattern on the top of the pie. You may need to adjust pieces of the filling as you work to get the lattice strips to lay flat. 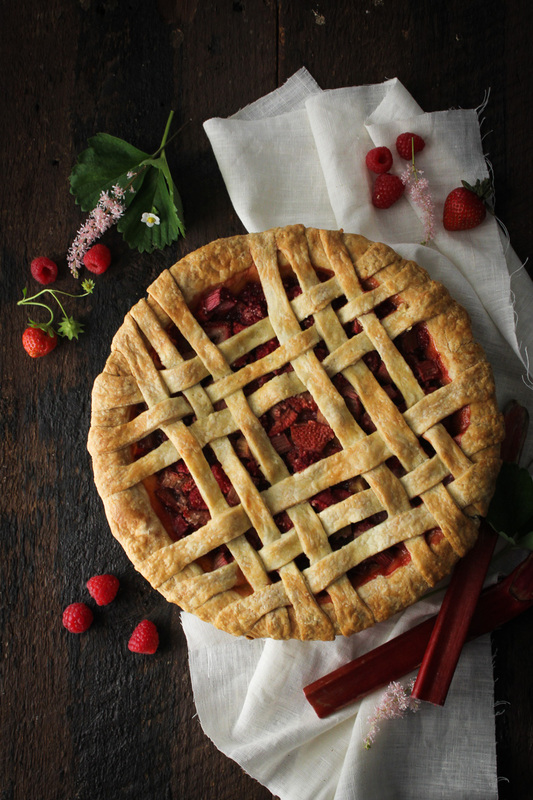 Once you are happy with the lattice, gently press the lattice pieces into the edges of the lower pie crust, then trim the crust, leaving just a little bit of overhang (the crust will shrink as it bakes – press the overhang under the rim of the pie pan if you want it to stay all the way to the edge). Use a pastry brush to brush all of the exposed pie crust lightly with milk. Bake for 20 minutes at 400 degrees F, then lower the temperature to 350 degrees F and bake until crust is golden brown and filling is bubbly, an additional 60 minutes. Let cool completely, preferably overnight, before serving. I have made this pie with both tapioca granules and cornstarch. Both help stabilize the filling, but neither is perfect. Feel free to use whatever you have on hand. Letting this pie sit for several hours before slicing it will help reduce soupiness.